Posted in 52 Ancestors Challenge on December 31, 2015 by Amy Johnson Crow. We have arrived at the last day of 2015 – the end of the year and the end of Week 52 in the 2015 52 Ancestors in 52 Weeks Challenge. When I set the optional theme for this week as “Resolution,” I said, “A resolution can be something that you resolve to do. It can also be the end or conclusion of something.” Though I hadn’t made a decision about the future of 52 Ancestors at that point, I think deep down I knew it was time for the Challenge — at least in its current form — to come to an end. 2015 has been intense, for lack of a better word. My career took a new direction, which presented challenges, but many, many opportunities. My mom has been fighting Stage 3C colon cancer. She had surgery, followed by months of chemo (with some radiation thrown in for good measure). Through it all, she has been a pillar of determination. Many of you have reached out to thank me for the 52 Ancestors Challenge. But I want to thank you. 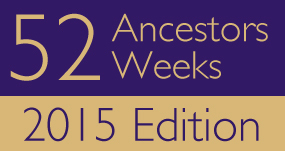 It has been wonderful reading the stories of your ancestors and how you discovered them. It has been wonderful getting to know you through your writing and through your dedication to genealogy and family history. You inspire me to learn more and discover more. Many of you have said that you intent to keep writing, but that it feels like time to move on from the Challenge. That’s how it feels to me, too. I’m not stopping writing by any stretch of the imagination, but I will be doing it over at my other site AmyJohnsonCrow.com. (You can click on the link to the blog near the top of the page.) I hope you will join me over there. From the bottom of my heart, thank you for your support and encouragement. Posted in 52 Ancestors Challenge on December 10, 2015 by Amy Johnson Crow. It’s a busy time of year, so let’s cut to the chase. It’s Week 49. Only 3 more to go! Who did you write about this week? Leave a comment with a link to your post. And curl up with some hot chocolate and take a look at the entries from Week 48. Posted in 52 Ancestors Challenge on November 27, 2015 by Amy Johnson Crow. Week 47. You know what this means, don’t you? Only 5 more to go! The theme for Week 47 was “Sporting.” Football players or baseball players in the family? How about an ancestor who was a good sport about things? Or did you do your own thing last week? Whoever you wrote about, leave a link in the comments below. Also, while you’re recuperating from the food coma (it was Thanksgiving in the U.S. yesterday), take a look at the posts from Week 46. Since it is a holiday weekend (at least here in the U.S.), you might be diving into some family history projects. If you’re going to be doing some scanning, take a look at my easy, low-tech tip for labeling photos as you scan. Watch for December themes coming soon! Posted in 52 Ancestors Challenge on November 19, 2015 by Amy Johnson Crow. There’s something about this time of year. The days are short, the trees are bare, and north wind reminds us that winter will soon be upon us. It makes me want to curl up with my laptop and dig even more deeply into my history. Also starting to think ahead to next year. Another 52 Ancestors in 52 Weeks Challenge? I don’t know. Maybe something new? What are your thoughts? Week 47 (November 19-25) – Sporting. Week 48 (November 26-December 2) – Thankful. Posted in 52 Ancestors Challenge on November 14, 2015 by Amy Johnson Crow. Week 45. Do you realize that means there are only 7 more weeks?! 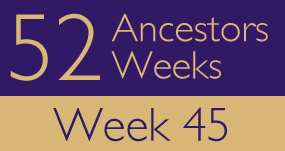 Leave your links to your Week 45 posts in the comments below. Also, be sure to look at the posts from Weeks 43 and 44! Week 46 (November 12-18) – Changes. Posted in 52 Ancestors Challenge on October 17, 2015 by Amy Johnson Crow. The air has definitely turned colder. In fact, we had a frost that killed some flowers last night. I’m not quite sure why, but I love this time of year. The optional weekly theme for Week 41 was “Colorful.” (I seemed to time it right with how the leaves look right now!) Who did you write about in Week 41? Regardless of if you used the theme or not, leave a comment with a link to your blog post. We’d love to read it! These cool days and nights are a good time to do some reading. You can find some good things to read back in Week 40. By the way, if you’re looking to improve your genealogy, I invite you to take a look at “31 Days to Better Genealogy,” a free guide with some of my favorite tips, tricks, and resources.